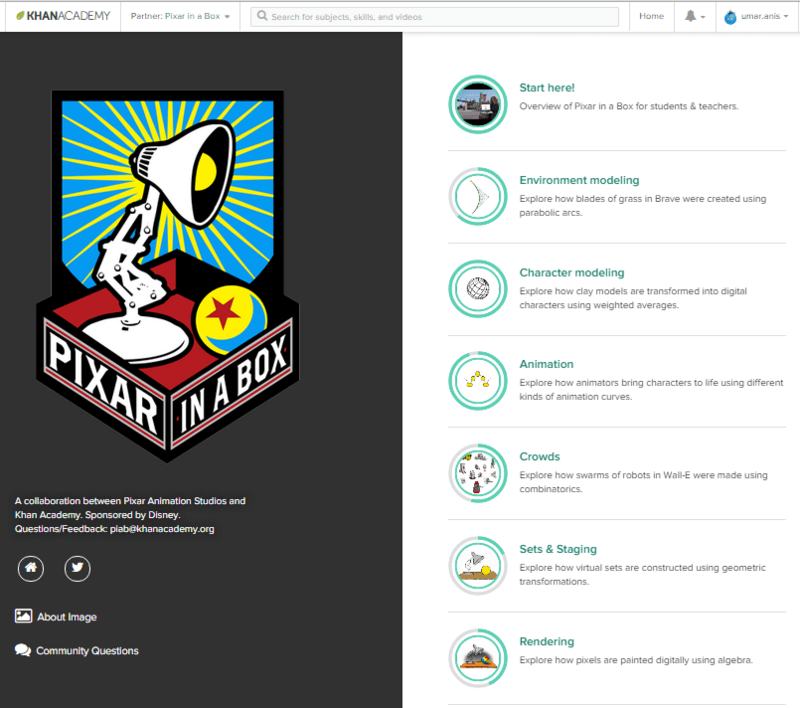 ‘Pixar is a box’ is an excellent tutorial at Khan Academy developed in collaboration with Pixar Animation Studios. It is about some of the Math concepts that we learn in school and how they apply to making animated movies. The content is meant for secondary school students (and above ). Tutorial sketches a broad outline of the pipeline for producing animation, with each lesson digging deeper into a particular concept and its Mathematics. 1- Environment Modeling talks about representing curves (parabolic curves) using three points, rather than equations. It is more intuitive to work with three control points while designing and animating curves. This knowledge about curves is applied to create grass blade. A lot of grass blades are put together with randomness and animation offsets to create a natural looking grass field. 2- Character Modeling describes how polygons are used to start modeling shapes and subdivision algorithm is used to smoothen out the edges. 2D sketch of Human hand is designed using this technique without much effort. The crux of the lesson is the mathematics of subdivision and its application in 2D and 3D. 3- Animation lesson explains the role of Bezier curve in representing animation. A realistic bouncing ball animation is created in hands-on exercise. 4- Crowds are created by joining a number of parts in various combinations. Lesson explores the concepts of permutations and apply it to calculating the number of possible combinations. 5- Sets & Staging deals with placing characters in the environment. Environment contains various objects which are placed around in the scene after scaling and rotating them as required. The lesson explains the mathematics behind these geometric transformations. 6- Rendering is a particularly exciting lesson which brings out the complexity of the whole process. While rendering we have to determine the color of each pixel in a frame taking into account all the light sources, camera position, all objects in the scene and how each object reflects or refracts light. This is done by casting rays out of the light sources and bouncing them off various surfaces. Diffuse and Specular properties of a surface determine how light will be reflected by it. ‘‘Pixar in a box’ is highly recommended as a fun way to learn. Thanks for the detailed feedback/review!